Making a hot soufflé is simpler than you think. This is essentially a sauce with whisked egg whites folded in. They look spectacular the minute they come out of the oven so the tricky bit is making sure that everyone is sitting at the table ready to enjoy the moment that they are ready. Preheat the oven to 200°C fan/220°C/425°F/Gas 7, and put a baking tray on the top shelf. With a pastry brush, paint the insides of four x 150ml/ ¼ pt ovenproof ramekins with softened butter. Making sure the brush strokes go up the inside of the ramekin, this help the soufflés to rise. To make the pureed sauce, blitz together the raspberries and sugar. Sift out the raspberry pips. 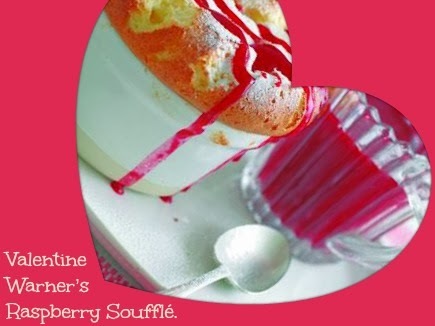 Cook the raspberry juice in a saucepan for a few minutes until it becomes reduced and syrupy. Take off the heat and add the rum. Put in a jug and set aside for later. Combine the milk and cream in a small saucepan, scrape out the seeds from the vanilla pod and drop them in the milk with the pod. Bring the milk up to a simmer and no more. In a separate saucepan, stir together the butter, flour and sugar. The mixture will look like large crumbs. Take the vanilla pod out of the cream and milk then reheat. Pour half of the cream and milk over the crumbs and stir to make a roux. Then add the rest of cream and milk, stirring to get rid of any lumps and heating gently until the mixture is a light pouring consistency. Separate the eggs, stir the egg yolks one at a time into the light roux mixture. Whisk the egg whites to a soft peak. Fold into the vanilla sauce until the two mixtures are fully incorporated. Fill the prepared ramekin dishes to the very top. Smooth the top with a knife blade and run your thumb around the inside of the lip of the ramekin, to stop the soufflés from catching when they rise. Put the ramekins on the hot baking tray in the oven and cook for 10-12 minutes until well risen and golden with a slight wobble to the center. 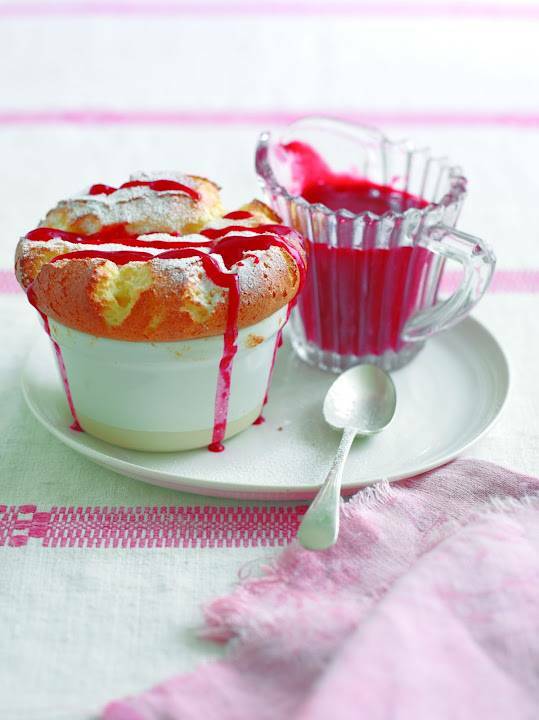 When risen, take soufflés out of oven and serve immediately dusted with sifted icing sugar with a drizzle of the raspberry puree. Mmmm … sounds delicious & looks great! Gehen heute bei Blogger die Kommentare wieder nicht?? That looks deliciously light! Thanks for sharing…stopping by from aloha blog hop on local sugar. Cheers!